Ranges will be replaced via Next Day Air Express Service. Packaging and a label for return of the defective unit will be provided. Any item not covered by warranty will require payment of part and labor charges. This warranty covers normal use and service of the induction range. The warranty is void if the product is used in any way other than what is deemed ‘normal’. (Refer to the Instruction Manual for Safety Precautions, Important Safeguards and Key Points). Induction ranges returned within the one (1) year warranty are subject to inspection by Spring USA. The aforementioned warranty is void if the unit has been damaged due to neglect. This includes, but is not limited to, improper use of the unit, failure to properly clean the intakes, insufficient cleaning of the unit, submersion, improper installation, overheating or damage to the exterior of the unit. The warranty is void if the unit has been altered or tampered with in any way by an unauthorized repair agent. Damage to the glass cooktop or the range housing is not covered. Any alteration of the cord or plug voids the warranty. For Non-US Customers: 1 year replacement warranty on all induction range parts. Spring USA is the original developer of the “Convertible Induction Buffet System”. Since 1999, the system has been used widely in installations around the world. Each component has been designed to optimize the performance of the complete system, based upon the original Swiss designs of the Spring USA concept. Recently, many companies have chosen to copy the system and/or elements of the Spring USA buffet concept. In many cases, these components are not compatible with the original Spring USA induction system. With that said, Spring USA cannot be held accountable for facsimile components, offered by other companies, with regard to their performance in a convertible buffet system. Do not store your SmartStone® Induction System in an unheated area. Material is operational in normal room temperatures of 68° F (or greater) at the time of system start up. If a mobile system is moved from a cooler area, allow the system to reach a temperature of 68° F (or greater), prior to use. Failure to do so, may damage the SmartStone® countertop. 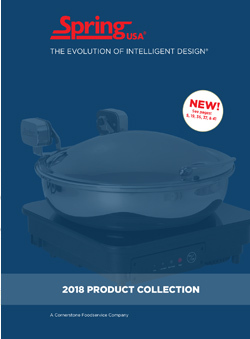 When using Spring USA servers or cookware on a SmartStone® Induction System, controls should always be set on the ‘Low’ or ‘Low-Med’ setting at the beginning of the serving cycle. If the vessel utilizes a water bath set up, such as a Spring USA Convertible Buffet Server, your temperature should start at ‘Med-High’ or ‘High’. Power should be increased only if the food is not maintaining proper serving temperature. When storing a SmartStone® Induction System, the countertop and sides should be protected with either a padded cover, or some other type of wrap. As a product enhancement, Spring USA Servers now come equipped with our new, “AA” All-Angles Axle System. This system allows you to keep your server cover open, at virtually any angle. In order to activate the resistance force, the server cover must be opened to a 45 degree+ angle, every time the cover is lifted. This change affects all Spring USA Servers, except for the following Item #’s: K2509-6; K2510-6/30 & K2510-6/40. Axles are considered a wearable item, which require maintenance; therefore, they are not covered by warranty. Under no circumstances, should the handle and spout assembly be disassembled from the vessel. Spring USA offers a one (1) year warranty, from the date of invoice, against manufacturers defect on beverage servers (specifically, Delta, Omega & Sigma Servers, represented by Product Series #175, 176, 185, 186, 195 & 196). This warranty covers normal use and service of the beverage server. The warranty is void if the product is used in any way other than what is deemed ‘normal’. Beverage servers returned within the one (1) year warranty are subject to inspection by Spring USA. The aforementioned warranty is void if the beverage server has been damaged due to neglect. This includes, but is not limited to, improper use, separation of the handle and spount assembly from the vessel, failure to properly clean the server according to the guidelines outlined on our website, insufficient cleaning of the unit, use of harsh chemicals on both, inside & outside of the server, submersion, improper maintenance, or damage to the exterior of the unit. The Company will, at its volition, repair or replace without charge, such products if it fails due to manufacturing defect, PROVIDED THAT: the products are maintained in accordance with the maintenance instructions. Again, coverage under this warranty is based on the inspection of the product by Spring USA personnel. If your product is deemed defective, Spring USA will replace the product free of charge with an identical item. If that item is no longer available, it will be replaced with a comparable product. If you believe you have a defective beverage server, contact the Spring USA office, at (1-630-527-8600) and ask to speak with a Sales Coordinator. You will need to be able to identify the type of beverage server you have, as well as provide the Invoice # or purchase date. You will be asked to provide a brief description of the defect, and/or provide a photograph. The Sales Coordinator will issue a Return Material Authorization (RMA). If it is determined that you have a warranty claim, you should ship the product, at your expense, to the address shown below. Use a shipping service that allows you to track your shipment (such as UPS or Federal Express). Improper packing of your product does not result in an automatic replacement if it is damaged in transit. Spring USA® (the “Company”) warrants SmartStone® products for commercial use that the Company will, at its option, repair or replace without charge, such products if it fails due to manufacturing defect, PROVIDED THAT: the products are maintained in accordance with the maintenance instructions. This includes reasonable labor charges needed to repair or replace the products covered hereunder. This warranty applies to SmartStone® material that is put into commercial use and maintained in the manner recommended by the Company relating to care for a permanent installation. Spring USA chafing dishes carry a ten-year warranty against manufacturers defects on welds and metal castings. Warranty does not cover abuse or normal wear and tear. Spring USA offers a lifetime warranty on all lines of professional cookware against manufacturers defect on pan body or the affixing of cookware handles. Interior, non-stick pan coatings are covered for one year from the date of invoice. Lifetime warranty does not cover damage caused by misuse or abuse of the product, through over-heating or mistreatment with metal utensils, improper cleaning, neglect, accidents or intentional alteration of the product. The Company will, at its volition, repair or replace without charge, such products if it fails due to manufacturing defect, PROVIDED THAT: the products are maintained in accordance with the maintenance instructions. Coverage under this warranty is based on the inspection of the product by Spring USA personnel. If your product is deemed defective, Spring USA will replace the product free of charge with an identical item. If that item is no longer available, it will be replaced with a comparable product. If you believe you have a defective piece of cookware, contact the Spring USA office and ask to speak with a Sales Coordinator. You will need to be able to identify the type of cookware you have, as well as provide the Invoice # or purchase date. You will be asked to provide a brief description of the defect, and/or provide a photograph. The Sales Coordinator will issue a Return Material Authorization (RMA). If it is determined that you have a warranty claim, you should ship the product, at your expense, to the address shown below. Use a shipping service that allows you to track your shipment (such as UPS or Federal Express). Improper packing of your product does not result in an automatic replacement if it is damaged in transit. Blackline SwissSteel cookware carries a lifetime warranty on the pan body. Designed to withstand the most intensive heat, this pan is perfect for searing. Weld-Mounted cast handle and solid carbon steel construction make this a back of the house favorite! All Vulcano 5-Ply Stainless Cookware products carry a lifetime warranty on the pan body and handle welds. Vulcano combines the best of Spring USA design, along with a Whitford Quantanium stick-resistant finish. Vulcano 5-Ply Cookware has a durable, ply, scratch-resistant, ceramic reinforced, non-stick interior cooking surface. For Use & Care Instructions, click on the pdf download, below. All Primo! products carry a lifetime warranty on the pan body and handle welds. Spring USA Warming Tray (specifically Model # ST-1220 & ST-1220-T) offers a one (1) year warranty, from the date of invoice, against manufacturers defect. This warranty covers normal use and service of the warming tray. The warranty is void if the product is used in any way other than what is deemed ‘normal’. (Refer to the Instruction Manual for Safety Precautions, Important Safeguards and Key Points). Warming trays returned within the one (1) year warranty are subject to inspection by Spring USA. The aforementioned warranty is void if the unit has been damaged due to neglect. This includes, but is not limited to, improper use of the unit, failure to properly maintain the unit, insufficient cleaning of the unit, submersion, improper storage, overheating or damage to the exterior of the unit. The warranty is void if the unit has been altered or tampered with in any way by an unauthorized repair agent. Damage to the glass cooktop or the tray housing is not covered. Any alteration of the cord or plug voids the warranty. Motif Cookware offers a one (1) year warranty against manufacturers defect of the non-stick, interior coating. Warranty does not cover damage caused by misuse or abuse of the product, through over-heating or mistreatment with metal utensils, improper cleaning, neglect, accidents or intentional alteration of the product. Motif cookware is constructed of die-cast, heat conducting aluminum, so pieces are at a lower weight per vessel for easier handling. Our exclusive, tempered glass, vented covers are reinforced with a satin finish, stainless steel rim. Pieces are perfect for induction, but designed for all heat sources. The stainless steel, rimmed cover is made of durable, tempered glass. Avoid rough handling or extreme temperature change, to avoid breakage. Breakage of the cover is not covered under warranty. To clean your Motif Cookware, wash with hot, soapy water after each use. Pieces can be placed in the dishwasher. Store carefully to prevent scratching; Avoid stacking cookware. When using Motif, (or any of our servers or cookware) on a SmartStone® Induction System, controls should always be set on the ‘Low’ or ‘Low-Med’ setting at the beginning of the serving cycle. If the vessel has a water bath, such as a Spring USA Buffet Server, your temperature should start at ‘Med-High’ or ‘High’. Power should be increased only if the food is not maintaining proper serving temperature.